"Why does the eye see a thing more clearly in dreams than the imagination when awake? " First off I want apologize for not posting anything this last week. One of our kittens did not return here the other day, so I was out looking all night, and I do mean all night and morning. I was out of it, but thankfully I found her some 28 hours later. Meanwhile I have been dealing with some legal matters, always a fun thing ;) and filling out forms for opening a business. Sorry about the lateness. So Today, or should I say tonight (being nighttime here in Denmark) I want to talk a little bit about some make up tips for Brown eyes. There are some people that think brown eyes can't wear eye popping ;) Eye shadows, but that is so fare from the truth. 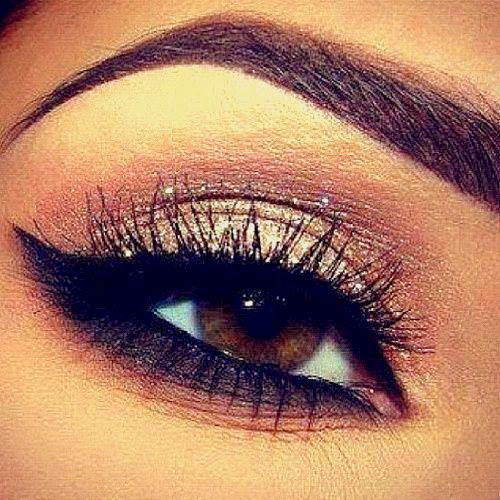 Brown eyes can be the perfect canvas as well as any other eye colors. If you have brown eyes then others might consider you to be lucky, because the eye shadow color range for brown eyes are the simplest and easiest because every cosmetic color matches with your eye color. From the darkest smokey eye colors to the lightest gold - every color will work on you. But sometimes it can still become very hard to choose which colors to consider. The very first thing to look at is your eye shape, some eyes are more rounded while others have smaller eyelids, each person on this earth has a unique eye shape. a visual interest can be created with a natural look. You can choose to wear dark color clothes which most women pass on as browns are deeper in color naturally. - Here are the makeup tips for 4 levels of brown eyes. This shade of brown color is the darkest. In some cases the irises appears almost black. For you; eye-shadow colors with a range of medium to dark color will suit you perfectly. There can be one problem and that is your makeup will sometime look too harsh or dark. 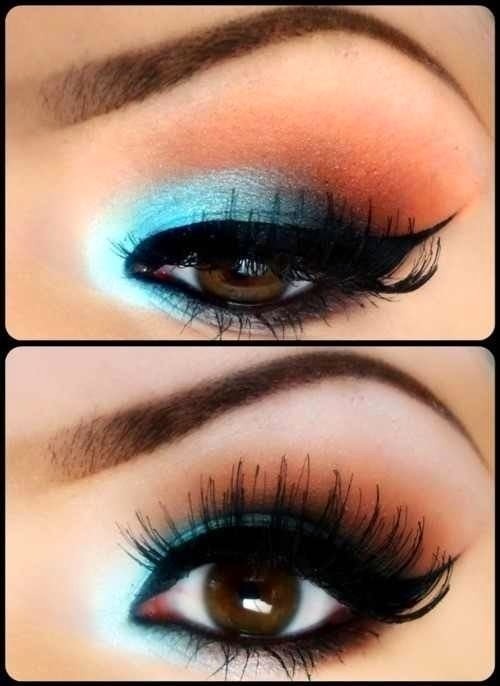 Hence you should use lighter color in the center of your eye lid and going towards your nose. It will look beautifully on you; the combination of highlight and darker colors. This is the simplest and the easiest color to work with. You can pretty much use any color that you want. Purple, Violet and Mauves all look absolutely fabulous on you. You can also wear gold, copper and bronzes totally opposite to it. Try lining your eyes if you want to use color. For something different you can use multiple colors or dramatic looks. Eyes with light brown color are eye catching and absolutely striking. If your irises contain golden flecks then you can use very pale yellow for highlighting. But be careful not to over-color your good looking brown shade. While you are enjoying different colors of brown, you can also try black eyeliner. For this level you can use any color which is little bit darker than your skin tones. Mauve and Champagne colors look great on you. To look totally different from others then try another color like dark brown, bronze or violet. Pink and Apricot highlight looks outstanding, too. Neglect black eyeliner as makes too harsh. Unlike other eyes, brown eyes don't have complementary or opposite color. It is a combination of different forms of colors. It contains yellow, red and blue. Hence it is easy to work with many forms of eye shadow colors when it comes to getting a more eye popping lid. For brown eyes Mauve makeup palette is one of the best makeup tips. According to most women this color is naturally enhancing. If you have extremely light brown or hazel eyes then you should go for dark colors as liner and select lighter ones to wear. You can also use some neutral shades like peaches and taupe's. Shimmer can be also used to match your eye-shadow color and is good makeup tip for brown eyes. Cobalt blue is also a great option to use. It draws the bright brown of your eyes. It doesn't matter if your eyes are darker or lighter, cobalt blue makes you look hotter.